Tidy Extension Cord Review – Is it the best choice? Does Tidy Extension Really Work? One of the biggest complaints that we have about our homes when it comes to electronics is the vast number of cords that we have to deal with. No matter what we try and do with them they always look messy and can sometimes create some safety issues. There are a few solutions on the market for this, and one of them may be Tidy Extension. The Tidy Extension is a retractable extension cord that is comprised of two plugs that will accommodate three pronged plugs, plus has two USB ports. An additional feature is that it is a flat design so it sits against a wall conveniently. The promoters of Tidy Extension claim that you only need to pull out as much of the cord as you need and the rest stays coiled neatly inside. One of the best benefits perhaps for the tidy extension is that extends up to six feet. The cost for the Tidy Extension is $19.99 plus $5.99 shipping and handling. It really doesn’t take much of a commitment other than for plugging it in. For the direct plugging into the wall overall this is a good idea, however you still have the cords to deal with that are going to be plugged into the Tidy Extension, so you are still going to be dealing with some cords, however overall they are somewhat organized. We are only going to give the Tidy Extension a Try/Buy review. Basically it is another alternative to a power bar, and you are able to make use of two sockets instead of just the one on your wall. It really is simply a more modern version of a standard two plug extension cord. For us what it has to offer really doesn’t justify the cost. We believe that there are better alternatives available for handling the messy cord issue.There are so many products available on the market that really address the messy cord issue that it would be well worth checking out some of those first before making your decision. It is true that the number of cords we have to deal with around the home with so many appliances and electronics that we normally use can create a real hassle. 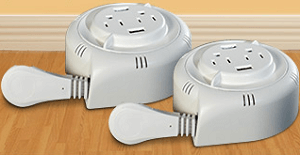 In the past we talked about the Side socket which is another solution for extension cords, and with this one we also gave it a risky try/buy however we did get a few positive reviews about it. What do you think? Does the Tidy Extension Cord work or not? Does the X Rocker 51396 Pro Series Video Gaming Chair Really Work? Does the Casio Smart Outdoor Watch Really Work? Does the Selfie Mic Really Work?